Sharon, thank you for that introduction and for all you do in your job to promote Environment Massachusetts. Mayor Mitchell I am thrilled to be here today. I, on behalf of all of our employees at Beaumont Solar, thank you for your leadership in driving the City of New Bedford to be one of the leaders in the State and the country in renewable energy adoption. Simply put, without the participation of the City, State and our partnership, Beaumont Solar, would not exist. My wife and I bought a 100 year old sign company in an inner city neighborhood of New Bedford, with the intent of leveraging its outstanding reputation and long customer base to diversify our offerings. We had company engineers and installers–whose skills of designing and installing “big” things and putting them into the ground and on rooftops–could be used to move us into renewable energy. After briefly looking into land based wind, and with the advent of the Green Communities Act, we decided to launch into the solar arena. With a low interest loan and assistance from the New Bedford Economic Development Council, we haven’t looked back. As of today, in just seven years, Beaumont Solar has grown 10-fold. The beauty of adopting renewable energy is that it creates a triple bottom line. Its undeniable that its great for the environment. Second, it great for municipalities, companies and residents, enabling them to capture substantial long term savings on the cost of the power they consume. And it creates real jobs, which are critical for our economy. We believe in keeping things local at Beaumont. We source as much as possible from local suppliers. When people apply for a job, I tell candidates that New Bedford residents get a preference. And I am deeply grateful that New Bedford has a leader in Mayor Jon Mitchell who likewise believes passionately in renewable energy’s triple bottom line promise. 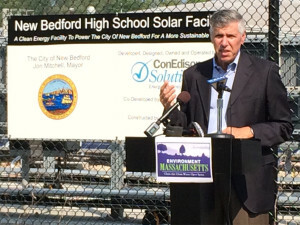 New Bedford has already deployed solar on school buildings and city owned land to the point that the city will save as much as $20M over the next 20 years by deploying solar. This is all great news and progress, but it is about to come to an abrupt halt if the caps are not lifted on net metering. Today, we can build a solar farm on a remote piece of land and “net meter” the power to community members. We call this community solar, where you don’t have to install it on your rooftop to get the benefits. This program was created by the state DOER, and has far reaching benefits. We have one such project we are developing with IGS Energy in Bourne, MA on the cape. Anyone can get cheap, clean power from this solar farm and benefit from it. However, if the utilities have their way, they will lobby members of the state house to dismantle this capability. They will do this by claiming that solar is costing grandma higher utility bills to pay for it. The fact is that grandma, can get cheap, clean solar power from our community solar farms. These farms are being built all over the commonwealth, where anyone can participate regardless of age, or financial stature. So in summary, Beaumont Solar is living proof that green adoption in the city is living up to its promise. We urge you to speak with members of the house and senate next week and advocate lifting the net metering caps and keeping the DOER-SREC program in place. Don’t let the utilities win this battle.